When we moved into our current house 18 years ago, we had a deck built, which included about 5 steps up from the backyard. Since my brother-in-law uses a wheelchair, we had the deck builder build us a removable wooden ramp that could be put on and taken off when my bro-in-law visited from Denver. We got lazy after a visit in 2012 and the ramp stayed on for a few years until we had the deck refinished last summer. We asked the deck refinisher guy to take the ramp off and slide it under the deck so he could refinish the steps. He did so and, in the process, pulled one board off the ramp. With my bro-in-law visiting this week, I got a few neighbors to help me reinstall the ramp this weekend and I realized I needed to hammer this single board back onto the ramp. Since I do handy work, well, never, I figured I’d head over the Home Depot to buy some nails (I do own a hammer). Before leaving for Home Depot, I glanced around the garage on the off chance I actually owned nails and, low and behold, I found a nearly full box of 10 common nails (whatever that means). They looked to be about the right size for the job so I pulled them off the shelf. It is simply inconceivable that I’ve ever purchased a box of nails and that reality became obvious upon inspection of the box. The box of nails was clearly from my dad’s house, a treasure I inexplicably saved when he passed in 1997. I’m sure I took them for sentimental reasons and not because of some grand plan to hone my non-existent carpentry skills. My dad’s box of 10 common nails carried a price tag of $1.09 for a pound of nails from Hardware City. I recall going to the hardware store with my dad as a child and it was either Cherrydale Hardware or Sears in Arlington, Virginia. I’m nearly certain there was no Hardware City in Arlington. That suggests the box of 10 common nails was purchased in Jefferson City, Missouri, before we moved to Virginia in 1966. So, at the very least, these nails were 50 years old. Despite some minor rust from living in humid garages for 50+ years, they were in tip top shape. I suppose the fullness of the box was also a reminder that while dad’s aspirations as a carpenter were grander than mine, his actual execution was about the same. 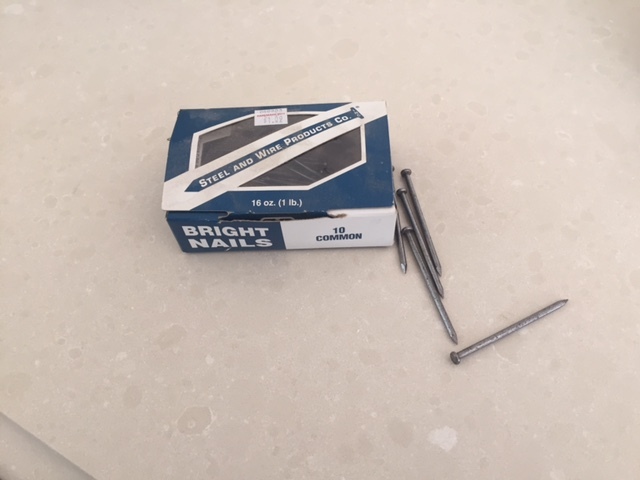 Oh, and in case you’re interested, Home Depot sells a one pound box of 10 common nails for $3.79 today so it turns out I’ve profited 3.5x the original $1.09 investment by hanging onto them. If only all my other investments performed so well. Finally, I took out a few 10 common nails and hammered the board back onto the ramp. It probably took about as much time and effort as it did for the original deck builder to build the deck, thus confirming my lack of carpentry skills. When the task was complete, I marveled at the fact that part of my dad was now forever built into my house. Every time I walk down the ramp, I’ll look down at the four 10 common nails that hold that board in place and recall my dad’s unrealistic, but always enthusiastic vision of himself as a carpenter. It will remind me of the times he actually did build stuff for my sister and me, like the pretend stove with peanut jar lids for burners. When I finished the job, it was time to shower and move on to my next activity, which was, sadly, attending the viewing of my golfing buddy, Sam, who lost a long battle with cancer on Wednesday evening. SamO, as we called him, left behind four amazing children ranging in age from 18 to 26. While they’re a bit younger than the 34 I was when my dad passed, we share the common bond of losing our fathers way too early. I didn’t have a chance to talk to them much at the viewing, but if I had I would have given them the same advice I gave the children of my friend Stu, who also lost his battle with cancer this year. Hold on tight to those memories. The pain will surely obscure them for a long time, but slowly the pain will ease and allow the memories to shine through like the first sign of sunshine after a big rainstorm. Save all those little things, including the 10 common nails, even if you can’t imagine ever needing or wanting them. Imagine how different my day would have been yesterday had I just hopped in the car and spent the $3.79 on a new box of 10 common nails. Instead I got to spend half a day (yes, it took about that long) doing “carpentry” with my dad. When I relayed the story to my sister, she replied that she still has dad’s stapler on her desk. She gets to spend time with him every time she staples a few pages together. How easy would it be for her to go to Office Depot and buy a new stapler? But, for some reason, she grabbed the stapler from his desk when we cleared out his estate and she spends time with him every time she staples a brief together. Losing a parent, especially at such a young age, is nearly impossible to process. I still think about dad at least once a day. There’s so much more I still want to talk to him about even 19 years later. This will never change for me or for Sam’s children or for Stu’s children. But, my hope and prayer for them is that they can find a few boxes of 10 common nails or a stapler and hold onto them. Hammer them into the deck. Staple a college essay with it. Spend time with dad, even when he’s not around in body. That’s how the memories survive and break through the pain. God bless SamO. God bless Stu. God bless all of their children. Thanks for this Bruce. Got me to spend a few more minutes with my Dad today. Great to hear you got to spend some time with him! Thanks for the blog about your dad. Some of most fond memories with my dad were riding around with him on his bus. He drove a bus part time out of Dulles Airport. My dad passed away in 2012. In 2013 I began working as a bus driver for Mont. County Ride On Bus. 2 years later I became a supervisor. Everytime I ride a bus or drive one, I think of my dad. I believe my dad is with me on the bus. From the time I left home I always wanted to make my dad proud. Wether it is accomplishments at work ,home ,military or school, I know Ive made my dad proud. Your essay here reminds me of those things and how my dad Is always around. Thanks for that great story, Brad.